The BEST Golf GPS Watches of 2019: Authentic GOLF WATCH Reviews. If you’re looking for a golf accessory that will immediately shave strokes off of your game, it’s time to take advantage of modern technology by purchasing one of the best golf GPS watches of 2019. Having accurate yardage to various sections of the green, hazards, and layup areas is incredibly valuable and can definitely shave a few strokes off of your game. For all intents and purposes, a golf GPS watch is essentially a caddie that is strapped to your wrist who has walked the course a thousand times. Adding a gps watch to your game is one the greatest things you can do to make better decisions on the course. 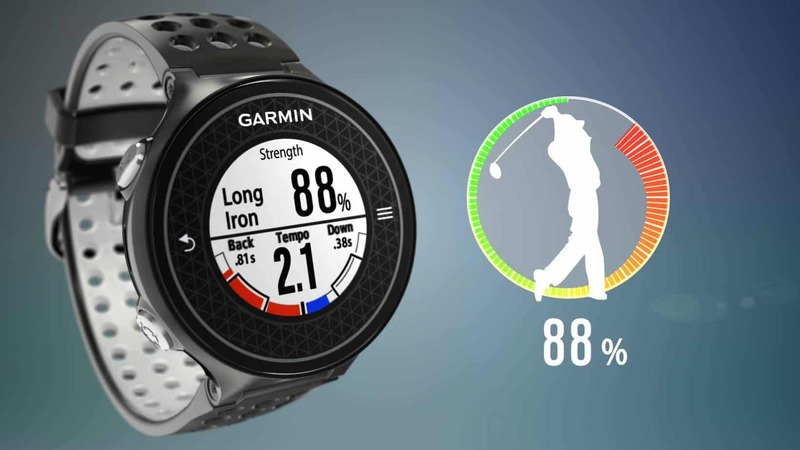 The best golf GPS watches of 2019 perform a myriad of on-course functions ranging from accurately measuring dogleg distances to gauging the number of steps the wearer has walked while playing the course. It is important to remember that no two players are exactly alike in terms of golf skill, on-course needs, or personal preferences. In the end, your buying decision may differ from another player in your foursome, your golf instructor, or your long-time playing partner. There’s a new kid on the block. Garmin has finally released the Garmin Approach S60 golf watch and it does not disappoint. This golf watch is jammed to the brim with impressive technology and is leaps better than the already impressive Garmin Approach S6. Garmin has definitely taken the golf watch to the next level and offers you its patented accuracy with new multi-sport functionality. Without sacrificing the quality of any features that make Garmin golf watches the best, they’ve added a ton more. The features of the Garmin s60 are unmatched by competitors and Garmin has proved (once again) that they reign supreme in the world of golf watches. As long as you don’t mind the price tag, this watch will provide you with everything you need on and off of the golf course. Without a doubt, this is the best golf GPS watch of 2019. 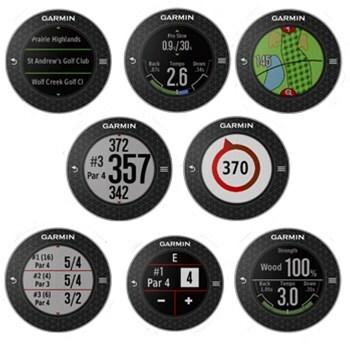 As you’d imagine, the Garmin s60 displays the yardage to all layup positions, hazards, and doglegs on the course. The clear color touch screen allows you to easily spot hazards. Garmin introduced this technology with the Garmin S6 and, if anything, has refined the accuracy and clarity. You can narrow yardages down to exact numbers, leaving no guesswork. Want to know how many yards it is to the front, middle, and back of the bunker? No problem. The same goes for any other hazard and any portion of any fairway or green. This technology is extremely valuable when playing a golf course for the first time. We’ve all estimated the yardage to a creek only to come up short and lose a golf ball. With this golf watch, that’s no longer a problem. Much like the Garmin S6, the Garmin Approach S60 golf watch’s touchscreen allows you to move the flagstick to any location on the green. This gives you exact yardages to any ridge or shelf on any portion of any green. This is a great improvement that prevents you from placing the ball on the wrong level or portion of the green. Estimating the yardage to the pin and leaving the ball on the wrong portion of the green can leave you with mini-golf type putts. As we all know too well, these positions tend to end in the dreaded three-putt all too often. One of the basic, but really cool features of the Garmin Approach S60 is the ability to change the watch bands really easily. This golf watch is already a very nice looking device that can be worn in any setting, but with the addition of changeable watch bands, you can easily switch between a leather and a silicon watch band. You can also switch the colors around and generally make the watch appropriate for multiple different occasions. With this added feature there’s no reason to have a “work watch” and a “play watch.” This golf watch will fit into (and impress people in) any scenario. Another one of the great new features (sensing a trend yet?) with the Garmin S60 is its activity tracking technology. 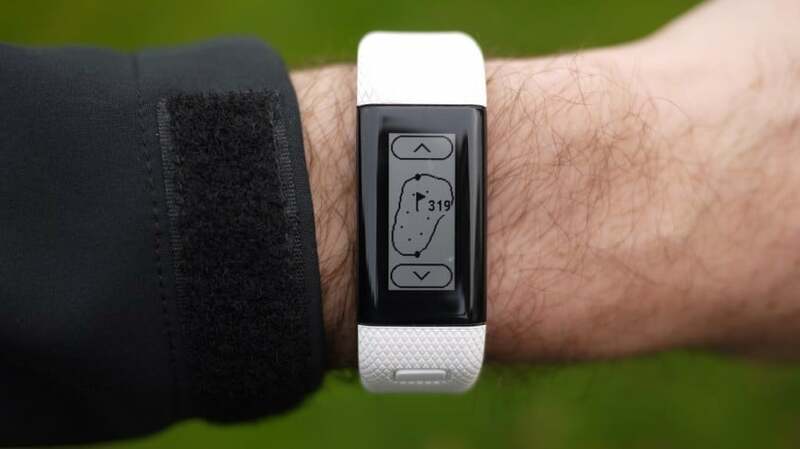 Not only will this golf watch accurately track your heart rate (with the purchase of an accessory), but it will also track activities other than golf. This golf watch comes preloaded with technology that can accurately track you while skiing, snowboarding, XC Skiing, stand up paddle-boarding, rowing, indoor rowing, swimming, walking, running, riding a bike, as well as other activities. 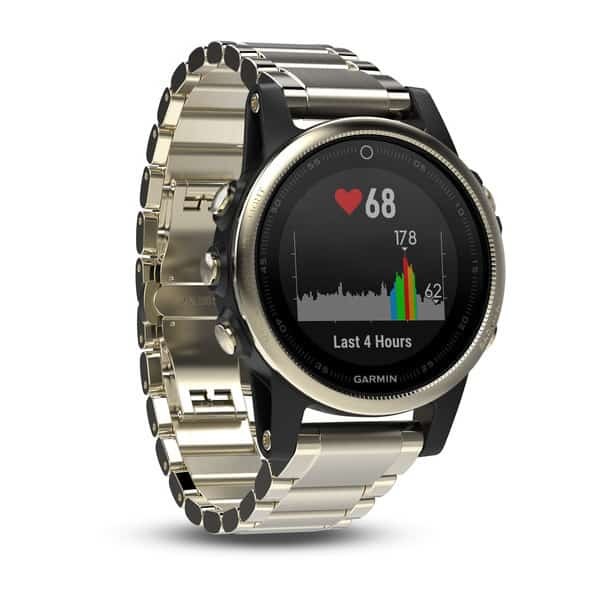 Garmin basically took some of the best technology from their running and overall activity watches and added it to this golf watch. 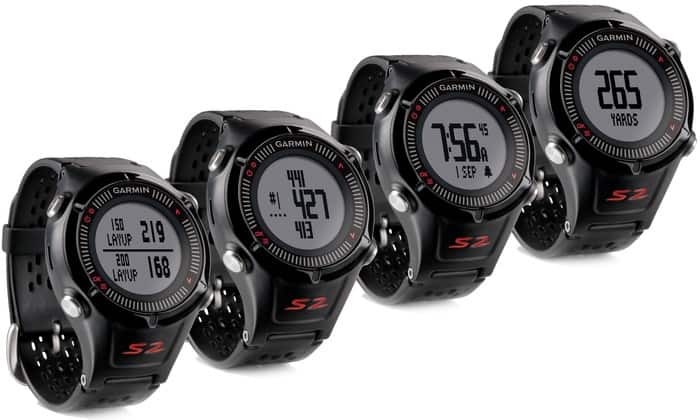 When you consider that Garmin charges about $600.00 for their activity watches, the price tag for the Garmin Approach S60 suddenly becomes appealing instead of burdensome. Needless to say, the Garmin Approach S60 is a great looking watch. In our opinion, this is Garmin’s best-looking golf watch to date. It has a sporty yet sophisticated look that pairs well with gym shorts, jeans, or a suit. For the days and nights that you want to dress it up, the watch bands are easily changeable to fit into any atmosphere. Garmin has done it again. 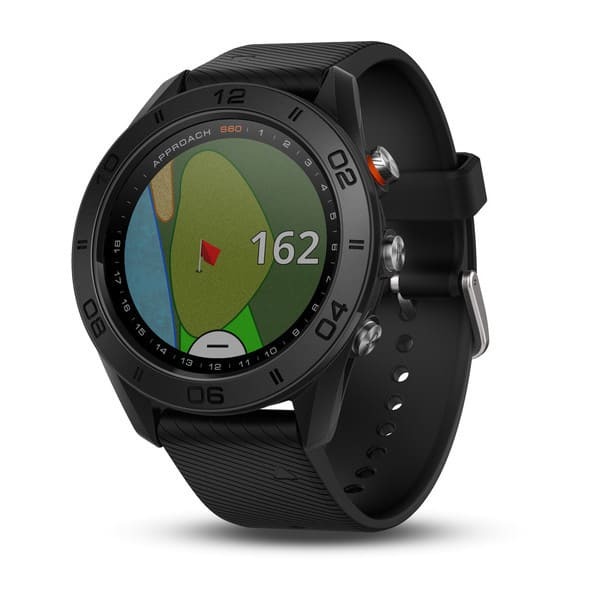 Just when you think they’ve made the best golf gps watch in the Garmin S60, they come out with the Garmin Fenix 5. To be clear, the Fenix 5 is more than a golf gps watch. It’s a multisport watch that is designed to take a beating and keep on ticking. Garmin not only focused on jamming the Fenix 5 with technology, but they also made several versions in several sizes so that you can tailor the Fenix 5 to your specific style and needs. While the Garmin S60 rains supreme in the world of the best golf watches, the Garmin Fenix 5 is by far the best multisport watch for golfers. This is a small, but important distinction. There’s no real debate that the Fenix 5 is the best multisport golf GPS watch of 2019. 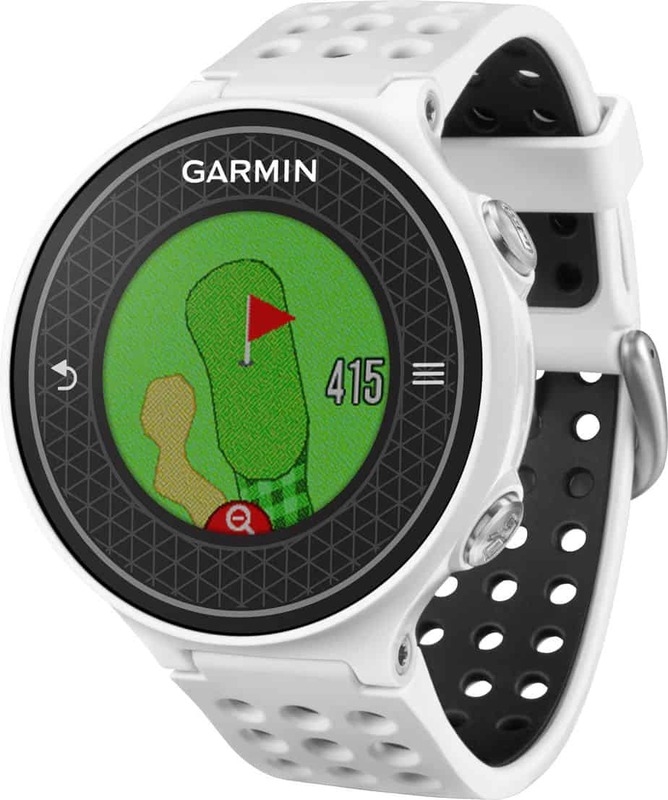 Just like the Garmin S60, the Fenix 5 golf watch allows you to use the screen to move the flagstick to any portion of the green. This technology provides you with precise yardages to any level or corner of any green. This is a great feature for pitching and chipping around the greens. We all know how frustrating it can be to pitch to the green and end up on the wrong level or portion. If you’re anything like me, this typically ends in a three-putt. 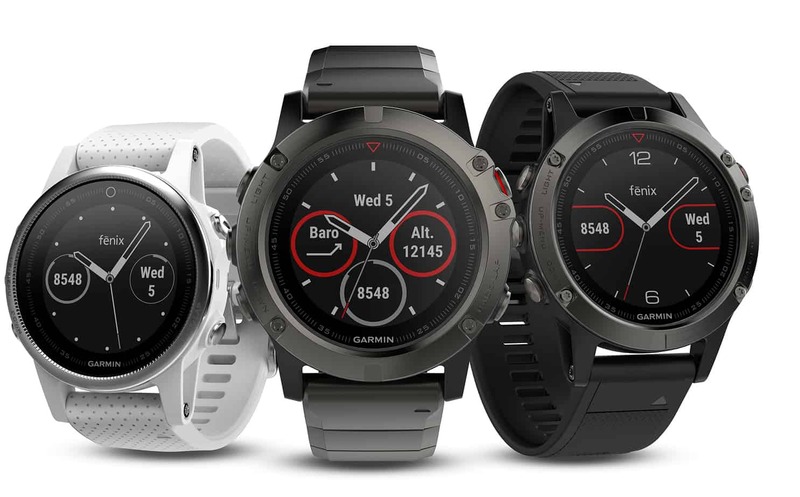 The Garmin Fenix 5 comes in three different case-housing sizes, but with one screen size. The case housing sizes are the materials that make up the watch head (42MM, 47MM, and 51MM). The actual screen size of the watch is 1.1 inches in diameter. This is large enough to display all information clearly without being too bulky or flashy. Its screen also comes in either glass or sapphire crystal depending on the model that you purchase. The display resolution is 218 x 218 pixels, which is great, but slightly less than the Garmin S60 (240 x 240). The watch weighs 67 grams if you get a silicone band and includes 64MB of memory (less than the Garmin S60). As you can tell from the image above, you can also personalize the watch face just like you can on a computer screen. Because the Garmin Fenix 5 is also compatible with TruSwing technology. If you’re familiar with this technology, it allows you to analyze just about every aspect of your swing. Simply strap the truswing to your golf club, turn it on, and pair it to your mobile device (or watch). The device will trace each golf swing from start to finish. And it will provide you with amazing feedback on your swingpath, clubface angle at impact, swing speed, etc. The Garmin Fenix 5 is fully bluetooth compatible and can pair with any bluetooth capable device. It will display your text messages, phone calls, ESPN alerts, emails, song selections, and anything else you can connect to via bluetooth. The technology is amazing and the interface/usability of the watch’s bluetooth feature is a great improvement on the Garmin Approach S6. It’s particularly useful if you typically receive a lot of text messages or emails while out on the golf course. Instead of worrying about your phone chiming during a backswing, you can just silence your phone and check your golf watch. By far the best aspect of the Garmin Fenix 5 watch is its multisport functionality. It offers you an insane number of features for multiple sports. This golf watch accurately tracks your heart rate and provides you with a ton of data that you can use to analyze your performance. In addition to simple step counters and tracking running, this watch tracks athletic performance and training. The watch is actually smart enough to let you know whether you’re training effectively, if you’ve peaked, or if you’re training too hard. It’s like having a personal trainer on your wrist while you workout or play sports. 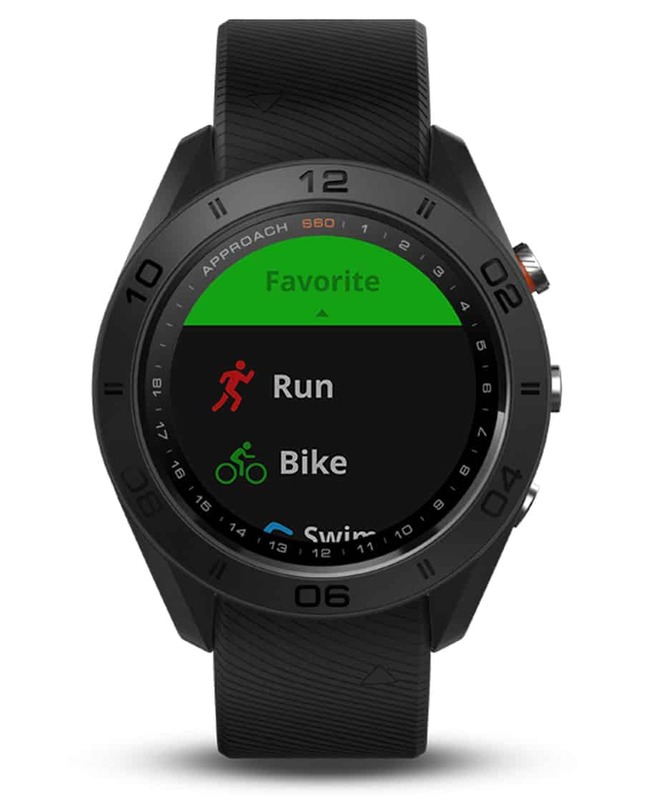 This watch tracks too many sports to mention here, but a few include: skiing, snowboarding, XC Skiing, stand up paddleboarding, rowing, indoor rowing, swimming, walking, running, riding a bike, hiking, rock climbing, etc. One of the big improvements of the Bushnell Excel Black is the full color air shots of each hole on the golf course. This feature allows you to see hazards on the course, hole shapes, and gives you distances. This a feature common to the premium Garmin golf watch products, but Bushnell is now introducing it. The only drawback (kind of a big one) is that the golf watch itself doesn’t display golf courses on the watch’s color screen. You have to access the color golf courses via your mobile telephone that is paired with your golf watch. 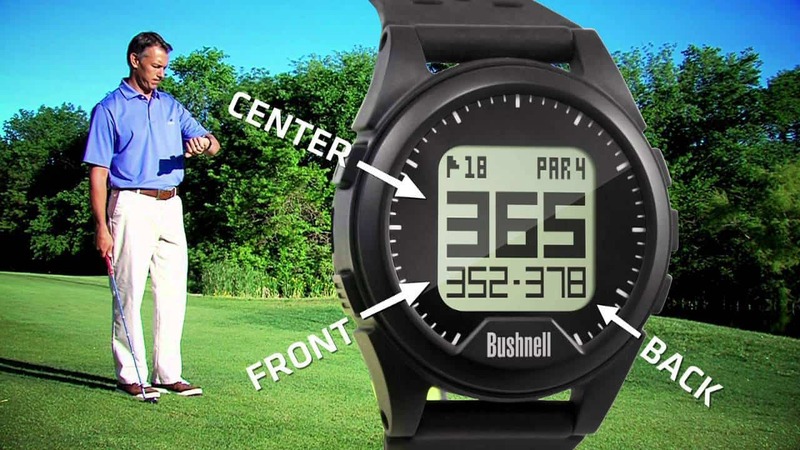 The Bushnell Excel Black offers golfers who don’t want to spend $300 a great option for a golf watch. While this watch doesn’t have all of the features of the Garmin color touchscreen products, you get what you pay for. This golf watch can be purchased for under $200 and features great battery life, a ton of preloaded golf courses, and other great features. Pound for pound this is one of the best golf watches for the money. Garmin’s Approach S6 golf GPS watch is one of their newer models and is a successor of the S5. This watch is a high-end golf GPS watch with features that changed the golf gps watch market forever. If you’re in the market for a color touchscreen golf watch and can’t afford the Garmin Approach S60, this is the product for you. Quite simply, Garmin has mastered the golf GPS watch and has cornered the market on high-end products. This is definitely one of the best golf GPS watches of 2019. The Garmin S6 provides yardage to the front, middle, and back of the green with high resolution finishes unlike any other golf GPS watch. 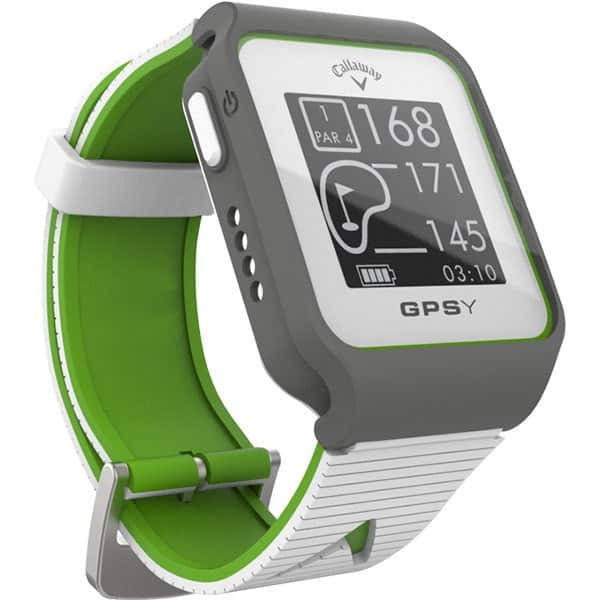 This watch features a high-resolution color touchscreen, which allows you to drag the pin to any location on the green. This feature allows you to dial in your shot down to the yard. When you’re playing a course with a large green, no more guessing the distance to the “middle-back” portion of the green. Like other high-end golf GPS watches, the Garmin S6 displays yardage to all layup positions and doglegs. You can easily spot hazards on the touch screen of the watch and measure yardages to any portion of any hazard on a golf course – a feature unmatched by any other golf GPS watch on the market. Regardless of what handicap you have, these features are going to shave strokes off of your game. Unlike other golf GPS watches, because you can see the hazards and get detailed yardage on a color screen, you will even save strokes on golf courses that you have never played before. 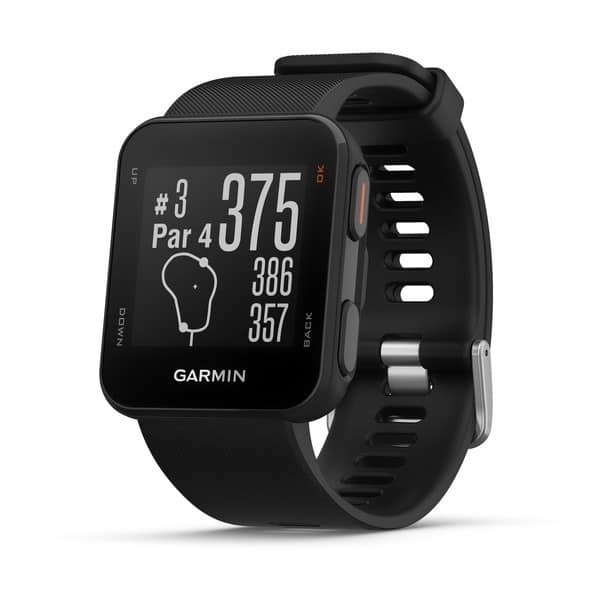 The Garmin S6 comes pre-loaded with over 40,000 different golf courses across the globe and does not require any type of membership/subscription fee or downloads of any kind. Simply charge it up and head to the course. The Garmin S6 also features automatic course recognition and the traditional hole advance feature that automatically places you on the next hole depending on your GPS location. The Garmin S6 features a 4.5 cm x 4.5 x 1.42 cm screen that is 1” in diameter. This screen is big enough to display the entire hole in full color at a 180 x 180 pixel resolution. The watch weighs 1.6 oz (lighter than the Bushnell NEO-iON). When looking at the watch you can easily see all of the yardages, hazards, etc., without feeling like you have a bulky computer on your wrist. According to Garmin’s website, the Garmin S6 will last for upwards of 10 hours on GPS mode and up to 20 weeks in watch mode. To translate that into golf rounds, in my experience, this watch lasts for about 27 holes before you need to recharge it. This is slightly less than other golf GPS watches that can typically last about 36 holes or longer. That being said, other golf GPS watches do not feature a high-resolution color touchscreen, so you kind of have to pick your poison. Either you have fewer features and a longer battery life or a lot of features and a shorter battery life. To put it simply, my old Nokia brick cell phone’s battery lasted a lot longer than my iPhone battery does, but I still have an iPhone. This feature of the Garmin S6 measures the relationship between upswing and downswing and expresses it as a ratio. In studies of successful golf swings, an ideal ratio of 3:1 has emerged, even with individual variations of speed. In plain English, this feature measures the tempo of your swing to train you to swing at the ideal tempo as measured and studied by golf professionals. The Garmin S6 is water resistant up to 50 meters and includes an odometer for step tracking during a round. Although step tracking if a basic feature of almost all golf GPS watches these days, most watches are water resistant to only 10 meters (except for the Bushnell NEO-iON, which is waterproof). This golf GPS watch allows you to keep the score on the watch itself, eliminating the need for scorecards and small pencils. This feature is a big improvement from the S2 version, as the S6 allows you to keep Stroke Play and Stableford scores, which can be downloaded to a computer and analyzed after the round. You can also keep track of the number of putts per hole, greens & fairways hit in regulation, as well as the average distance of various shots all on the GPS watch. If you’re really into the stats, you can compare stats with other players online through Garmin Connect and simulate your best possible golf round by pairing all of you best scores on individual holes on a given golf course. Stat nerd heaven!! This golf GPS watch is also equipped with a Bluetooth feature that allows you to pair it with your cell phone. This allows the user to receive emails, texts, alerts and other notifications right on the watch. The Garmin S6 displays whatever your iPad® or iPhone® (4s or later) can display wirelessly via Bluetooth. The Garmin S6 is an athletic looking watch that has an almost futuristic feel to it. It’s light weight (1.6oz) and can be worn casually or with a business suit (depending on the color). Although it does have a sportier feel to it, I don’t mind strolling into the office with this watch on my wrist (though it will definitely attract some attention). This one is a great option if you don’t watch to spend the money on a Garmin Approach S60. The Garmin S6 still packs a serious punch and offers you everything you need in a golf gps watch. If you’re in the market for a high end golf watch and love fancy features and customization, this is a great option. It’s far cheaper than the Garmin Approach S60 and will still blow all of your golf buddies minds. From the golf range to the golf course, the Garmin S6 is solid and it offers almost every feature that you could want in a golf GPS watch. 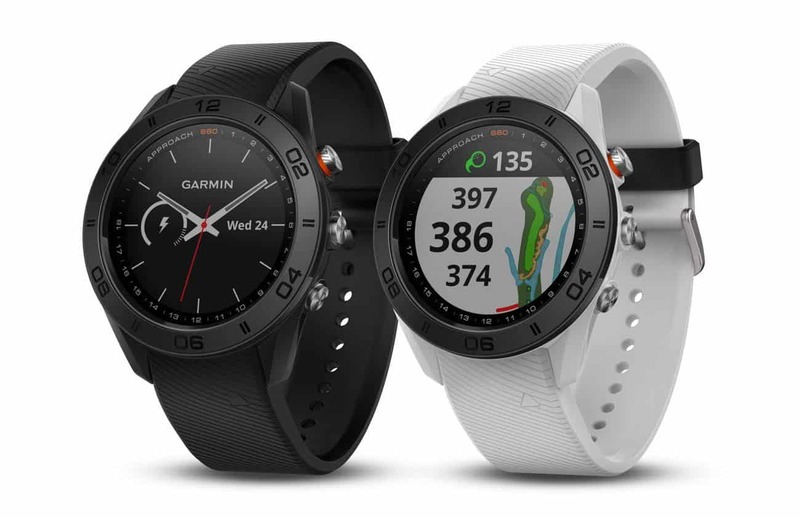 During the 2018 golf season, Garmin expanded into the affordable golf watch market. Historically, Garmin has made high-end golf watches packed full of cutting-edge features. The Garmin Approach X10 is Garmin’s more affordable version of the Garmin Approach X40, but it does not disappoint. It comes loaded with all of the golf features that matter most and it won’t break the bank. The Garmin Approach X10 comes preloaded with more than 41,000 courses worldwide. If you’re a golfer who values an unobtrusive band over a fashionable watch then the Garmin Approach X10 may be the best golf watch for you. The Garmin Approach X10 is all about its sleek design. The golf watch weighs only 1.1 ounces and you can barely tell that it’s even on your wrist when you wear it. It has a narrow screen that is sunlight readable with a singular button and a touchscreen display. The Garmin Approach X10 also has a 5 ATM water rating, which means that you can wear the watch underwater up to 40 meters (or 130ft). And if you’re hesitant about the narrow nature of the touchscreen, don’t be – it displays course information clearly. The only drawback is that it can be difficult to navigate at times for people with large fingers. The Garmin Approach X10 features yardage to the front, middle, and back of the green like all of the best golf watches. It also features hazard yardages and yardage to layup positions on any hole that you’re playing. Its auto-advance hole feature eliminates the need to manually advance to the next hole and its digital scorecard eliminates the need for a paper card and pencil. 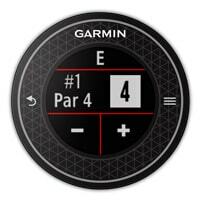 But what’s surprising is that the Garmin Approach X10 also features Garmin’s drag and drop pin placement technology, which allows you to move the pin to any location on the green for exact yardage. This is a feature typically found on Garmin’s premium line of products, but that you’ll also find on the X10. Overall, the Garmin X10 is the best golf watch for the money for golfers looking for an affordable and low profile golf watch. If you like this golf watch, but also want extra fitness tracking features, such as a heart-rate monitor, then you should check out the Garmin Approach X40. The Garmin Approach X10 boasts phenomenal battery life. 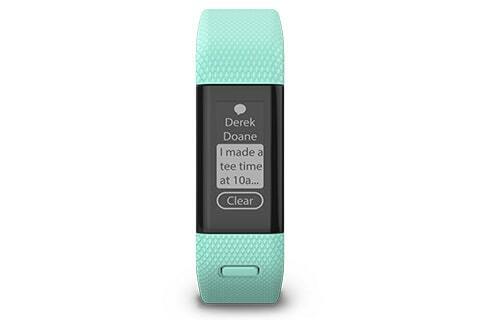 Because of its slim profile and small screen, it can last up to 3 full rounds of golf (12 hours) in GPS mode. This is better than almost any other golf watch out there (with the exception of the Garmin Approach S10). When the golf watch is not in GPS mode, it can last up to 14 weeks without needing a recharge. 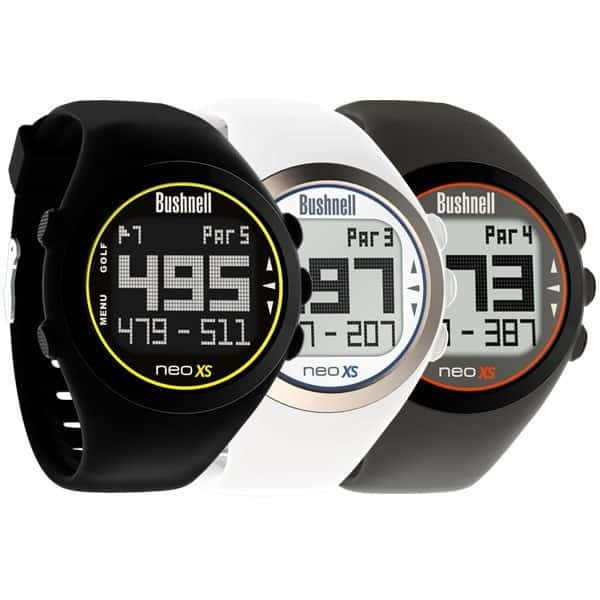 The Bushnell NEO-iON golf GPS watch is the newest watch in Bushnell’s line and is the successor of Bushnell’s NEO XS golf GPS watch (released in 2014). 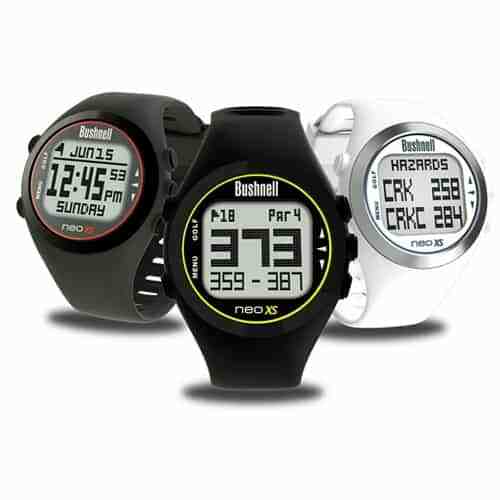 The price point of the Bushnell NEO-iON along with its unique features make it one of the most competitive golf GPS watches on the market. This watch is not the Garmin S6, but it is certainly one of the best golf GPS watches of 2019. According to Bushnell’s website, the NEO-iON will last for upwards of 16 hours on a single charge and takes two and a half hours to fully recharge. To translate that into golf rounds, in my experience, this watch lasts for three full rounds before needing an additional charge (and still has juice left). 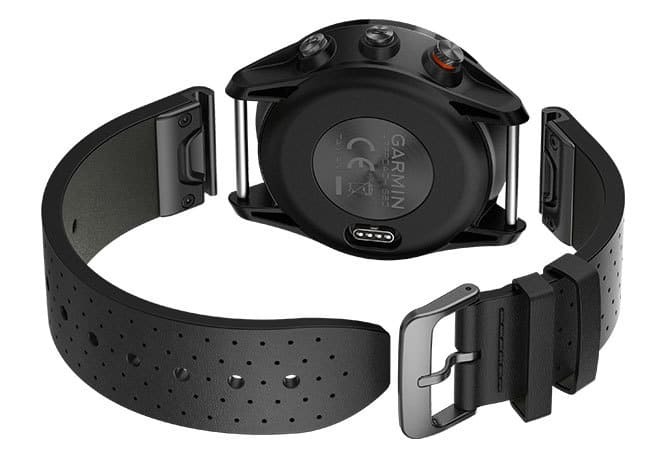 The battery beats out a lot of other watches, including the Garmin S6, Garmin S2, and Garmin X40. If you are concerned about battery life alone, the NEO-ion is one of the best golf GPS watches for battery life. While some other golf GPS watches can easily be worn to the office, the Bushnell NEO-iON boasts a more athletic look and feel. While the watch isn’t clunky or flashy (depending on what color you choose), it’s better worn with a casual outfit or athletic wear as opposed to a business suit. That being said, it is a very nice looking athletic watch. Save the silver or gold watch for the office, and put this phenomenal piece of machinery to use on the golf course. If you’re in the market for a golf GPS watch and you do not want to spend $200, buy the Bushnell NEO-ion. Bang for buck, it has no real competition on the market. 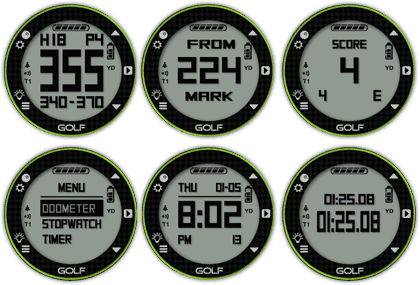 The NEO-iON offers almost every basic feature that you could want in a golf GPS watch, including a few extras. 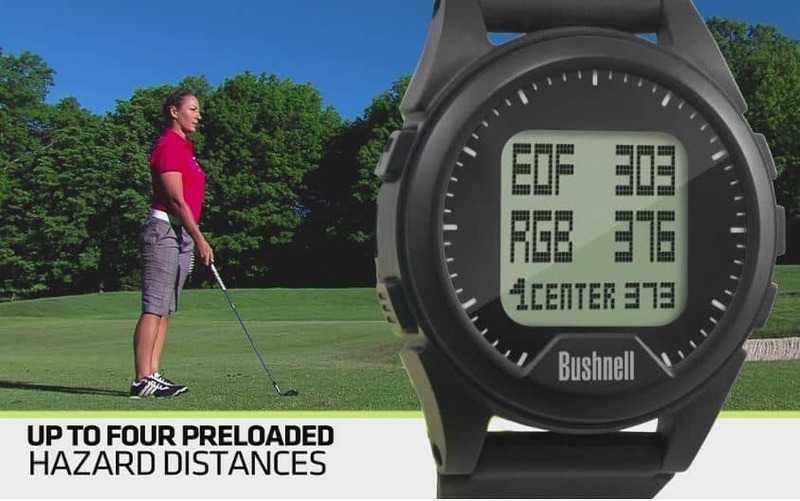 With the inclusion of the shot distance calculator, the Bushnell NEO-iON is one of the best golf GPS watches for the money. Garmin’s Approach X40 golf GPS watch is their newest watch on the market. It’s far slimmer and simpler than their Garmin S6 model. With this watch, it appears that Garmin has made the decision to move away from fancy color screen technology towards a sleeker more athletic design. Despite this watch’s low profile, it comes loaded with a ton of cool features and is definitely worth checking out if you’re comfortable spending around $250. The Garmin X40 provides the yardage to the front, middle, and back of the green like traditional golf GPS watches. 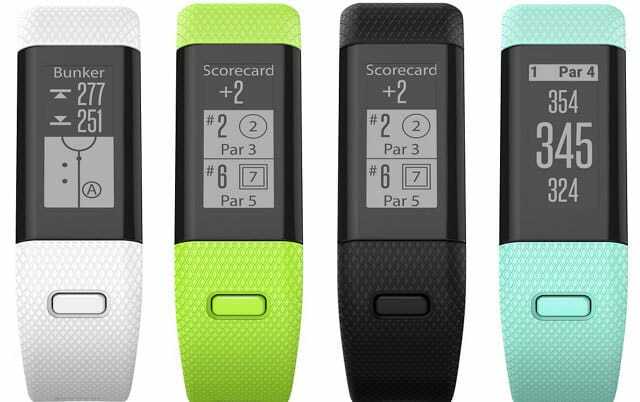 However, the X40 combines the popular step tracking/activity tracker/heart rate monitor technology into the golf experience. 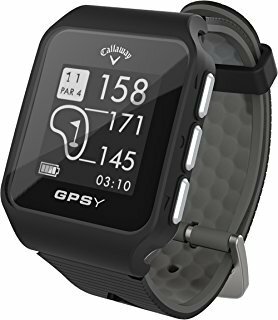 If you’re in the market for a golf GPS watch and like fitness trackers and/or are fearful of a larger watch interfering with your golf swing, this is the golf GPS watch for you. Garmin’s innovative approach to this golf GPS watch makes it one of the best golf GPS watches. Like other high-end golf GPS watches, the Garmin X40 displays yardage to all layup positions, doglegs, and other hazards. You can easily spot hazards on the watch screen and measure the distance to any portion of any hazard on a golf course. Although the hazard yardage screen is a bit funky, it is accurate and efficient once you get the hang of it. The Garmin X40 features a 1.00” x 0.42” display screen that is 160 x 68 pixels. 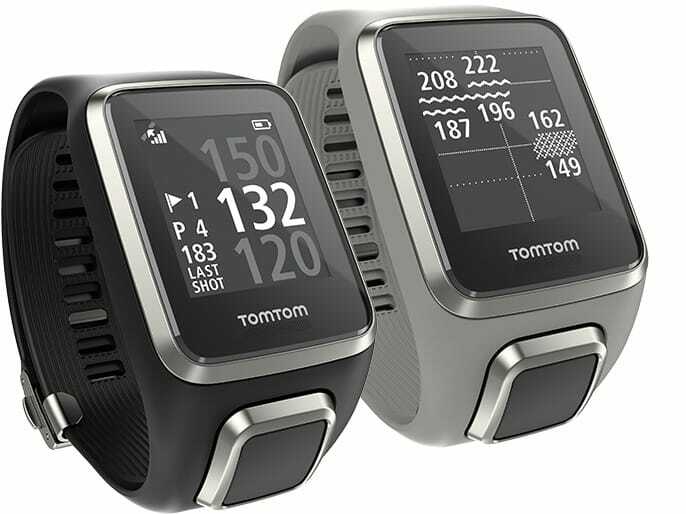 This is a much smaller screen than any other golf GPS watch on the market and mirrors the look and feel of an activity tracker. However, don’t think that the small screen display is unable to convey critical information. This sunlight-readable screen is big enough to display everything that you need to shave strokes off of your game. The X40 golf GPS watch was specifically designed with Green View Display, which shows you the shape and contours of the green as you play each hole. In addition to seeing how the green slopes, you can move the pin around to get exact yardages to various portions of a green. This feature allows you to really dial in your short game. You can accurately pitch wedges to the flagstick and figure out how the ball will roll on the green without walking up to the green before your pitch like the pros. This feature is definitely a great addition, and an unexpected one considering the size of the watch face. The Garmin X40 golf GPS watch is the thinnest and lightest golf GPS watch on the market. The slim band makes this a great option for golfers who have reservations about swinging a golf club with a watch on their wrist. 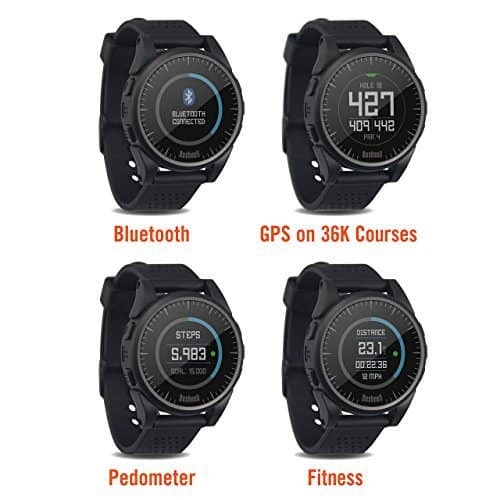 With the addition of activity tracking technology on a golf GPS watch, Garmin is clearly trying to cash in on the Fitbit and activity tracking craze. 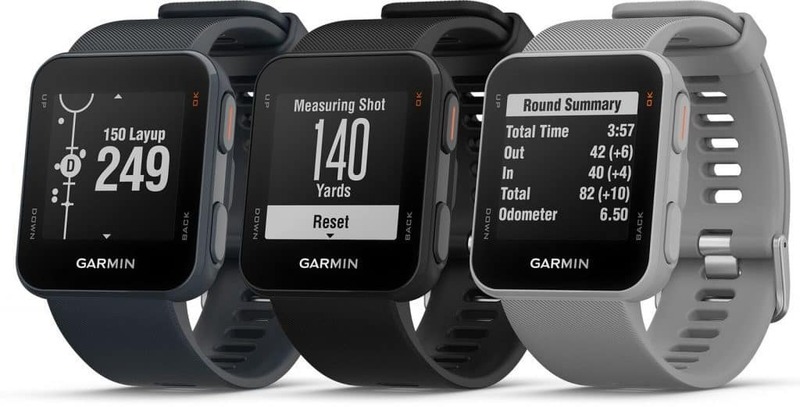 However, in doing so, Garmin may have unintentionally (or intentionally) eliminated a major concern of many golfers interested in golf GPS watch technology. This watch’s low profile and slim band makes you forget that you even have it on your wrist. If you have reservations about wearing a large watch while swinging the golf club, this is one of the best golf GPS watches. The activity tracking technology in the X40 shows distance traveled, steps taken, calories burned, heart rate, and activity intensity. 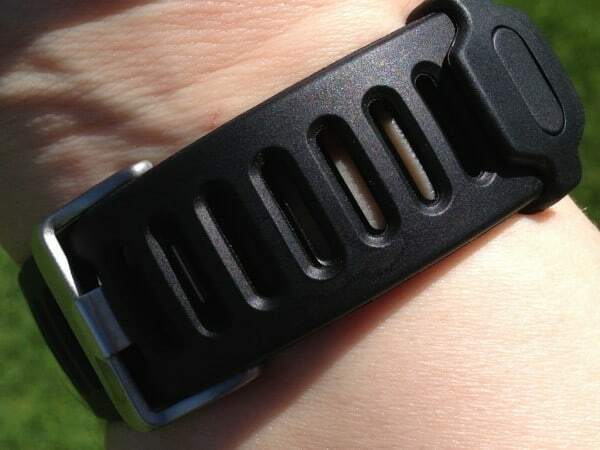 The band measures your heart rate throughout the day and does not require the use of a heart rate strap. The heart rate monitor checks your heart rate at varying levels of consistency depending on your level of activity. When you engage in a physical activity, the heart rate monitor provides feedback more frequently as the device is attempting to provide you with accurate information. However, when you are not engaged in an activity, the monitor checks your heart rate less frequently. Overall, the devices is fairly useful for tracking heart rate when you are moving around but suffers from the limitations of a wrist-based heart monitoring device. According to Garmin’s website, the Garmin X40 features a lithium-ion battery that will last for upwards of 10 hours in GPS mode. Put simply, I’ve found that the x40 lasts for up to three full golf rounds. 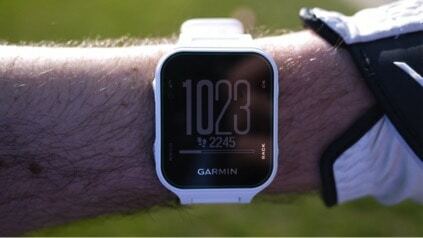 This is a bit better than Garmin’s S6 golf GPS watch, likely due to the smaller screen. Three rounds of golf is above average for a golf GPS watch as other golf GPS watches typically last about 36 holes. Because this golf watch has so many features jam packed into it, I give the X40 a slight edge in the battery department over most golf GPS watches on the market. This Garmin X40 golf GPS watch allows you to keep the score on the watch itself (similar to the S6) and allows you to upload your scores and rounds to a computer for post-round analysis. Additionally, if you play a course multiple times a year, the X40 allows you to patch together your best scores on each hole so that you can assemble your perfect round. The Garmin X40 golf GPS watch also has an optional feature called TruSwing. This technology attaches to your golf club and gives you real-time 3-dimensional animations of your golf swing and other metrics that are great for figuring out how to optimize your game. This feature is great for the golf range and provides helpful stats that shave strokes off of your game. This golf GPS watch is a sleek low profile golf watch that includes all of the features you want in a golf GPS device. In addition to measuring your heart rate and offering activity tracking like a Fitbit, it eliminates the need for an additional activity tracking device. The Garmin X40 is super lightweight at 1.1oz and has an athletic feel to it. This watch is not the most stylish watch on the market but it certainly won’t offend anyone, and most people will likely assume that you have a Fitbit. 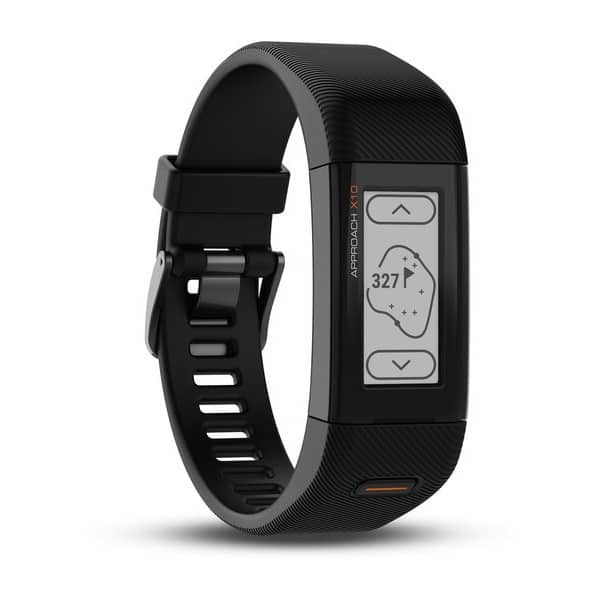 This golf GPS watch is the best option for a golfer with an active lifestyle. It gives accurate yardage, has a great battery, and provides distances to the hazards. But what makes this GPS watch one of the best golf GPS watches is the additional technology that is somehow jam-packed into this small device. 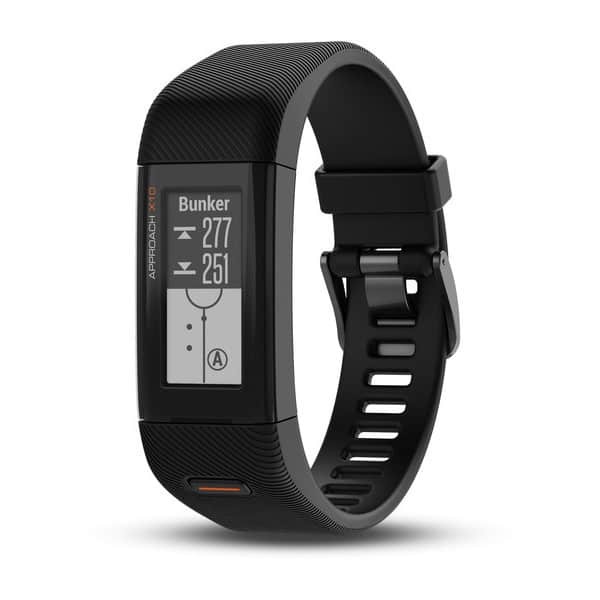 Not only does it measure your heart rate and offer activity tracking like a Fitbit, but it also provides the Garmin connect technology allowing you to connect with the golf community around you. 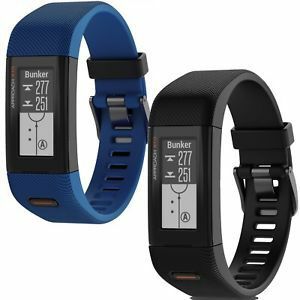 If you’re in the market for a high-end golf GPS watch, but love the technology of a FitBit, this is the golf GPS watch for you. The Garmin S10 Approach golf watch is a classic and simple looking watch. It’s not bulky, it’s not flashy, it’s not trying to be something that it’s not. Garmin is clearly offering a watch that looks like an apple watch. Sim, unobtrusive, and light, the Garmin S10 comes with some great features. To keep costs down, the screen is not a touchscreen. You navigate the golf watch using four buttons placed along the sides of the watch-face. The golf watch also features a comfortable silicone strap and is water-resistant up to 50m. This high-resolution screen on the Garmin Approach S1 is sunlight readable. This means that you can easily see the watch screen (and the information on it) on bright sunny days on the course. A huge issue with some golf watches is the glare that reflects off of the screen’s surface in direct sunlight. This the watch hard to read and can be really frustrating. The Garmin Approach S10’s screen is somewhat like an Amazon Kindle screen in that it doesn’t reflect glare when you stare into it. This is a simple but great feature of this golf watch. 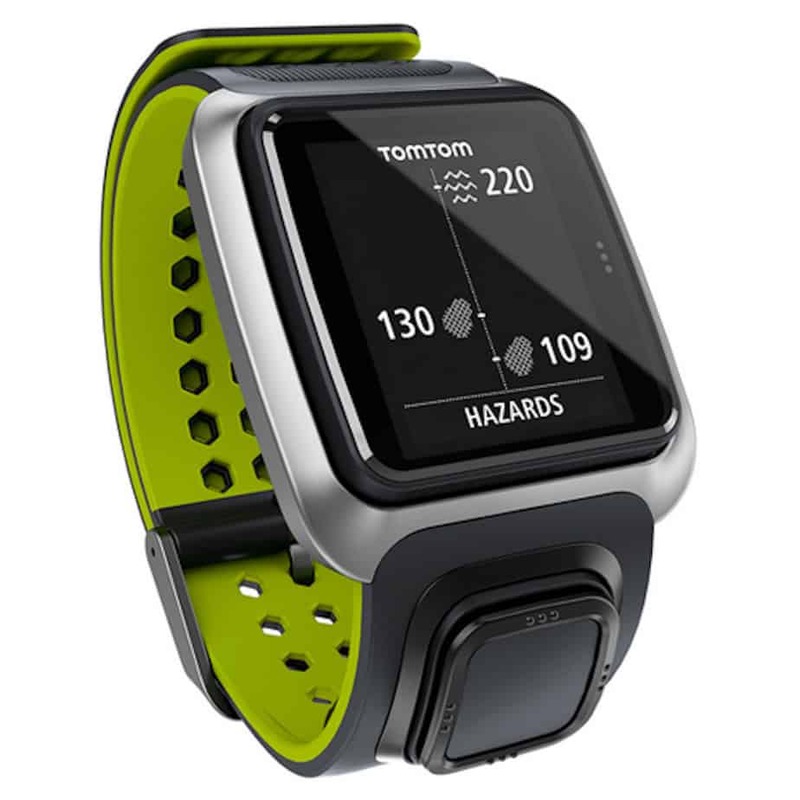 The Garmin Approach S10 will give you the yardage to the front, middle, and back of the green and will give you yardages to various hazards that you’ll find on the golf course. The golf watch will also measure each of your shots and features a digital scorecard eliminating the need for paper scorecards. The golf watch will auto-detect your movement to the next hole and unlike other golf watches, doesn’t seem to get confused while you’re on the golf course. While this golf watch isn’t packed with a ton of bonuses or extras, it offers you everything you need when playing. The Approach S2 is one of the best golf GPS watches on the market year after year. This is why (not so) surprisingly, it is still one of the best golf GPS watches. It has staying power – plain and simple. 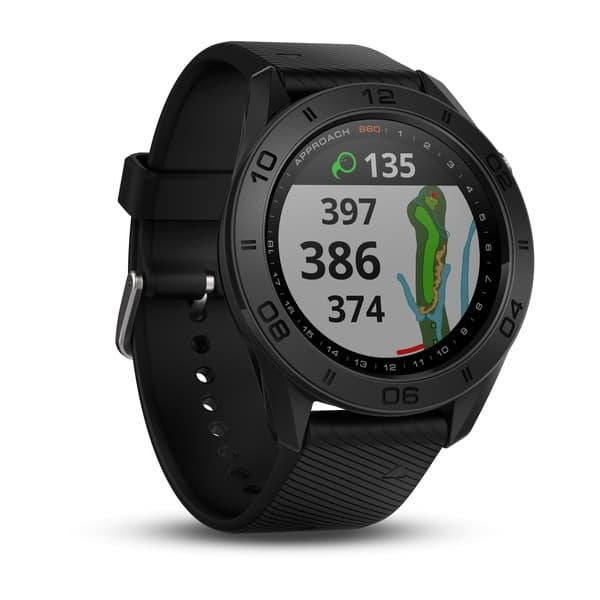 The Garmin S2 golf GPS watch provides the yardage to the front, middle, and back of the green and gives you yardage to two layup areas on a given hole. This golf GPS watch is also one of the most affordable golf GPS devices on the market. If you are on a budget, have a simple game and value consistency, this is the watch for you. This watch does not offer yardage to bunkers or over ponds and similar hazards and it does not give you the width of the fairway. In that regard, the watch is limited in its capability. If you’re a golfer that is hungry for every detail of the course, you may consider purchasing the Garmin Approach S6. However, for the budget-conscious weekend golfer, this watch has tremendous value. Garmin is currently selling the Garmin x40 golf GPS watch so the S2 is not exactly “new” technology. However, it is a smart and affordable alternative to some of the more expensive watches. With 38,000 different golf courses across the globe loaded into the watch, you’ll be hard pressed to find a course that isn’t covered. The Garmin S2 also features a built-in digital scorecard, which allows you to enter your scores directly into your watch with ease. No more logging scores in scorecards with pencils and pens, only to lose the scorecard and the valuable round data. The Approach S2 has a one-inch monochrome LCD with 64 x 32 pixels. 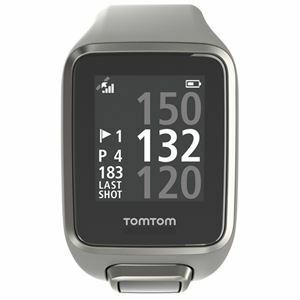 The watch offers front-middle-back yardage, yardage to the layup position and the dogleg, and a scorecard for digitally keeping your score in real time (and uploading your rounds to the computer later on). The Garmin S2 boasts a battery life of about 36 holes of golf while you’re actively using the golf GPS function. This is enough for a long day on the golf course with your friends. But remember, it must be fully charged for you to get this much golf out of it. If you’re not using the GPS function, the watch will stay powered for about three weeks without needing a charge. This is a versatile watch that can be worn casually or to work. The black model is not clunky or flashy, but is nice enough to get noticed by anyone paying attention. If you’re into a bit more flash, the Garmin S2 golf GPS watch comes in a variety of colors. The functionality of a GPS watch is more important than a fancy layout or a touch screen and this watch makes your game more predictable for the right price. This watch has been sold (new) on amazon for as low as $99. Buy this watch if this is your first time purchasing a GPS watch or if you’re frustrated with another model. Because this watch is predictable and offers great features, it is still one of the best golf GPS watches. If you’re interested in checking the current price on amazon.com, check out the link below. Garmin’s Approach S20 golf GPS watch was released before the Garmin x40, but is still considered to be one of the newer golf watches on the market. 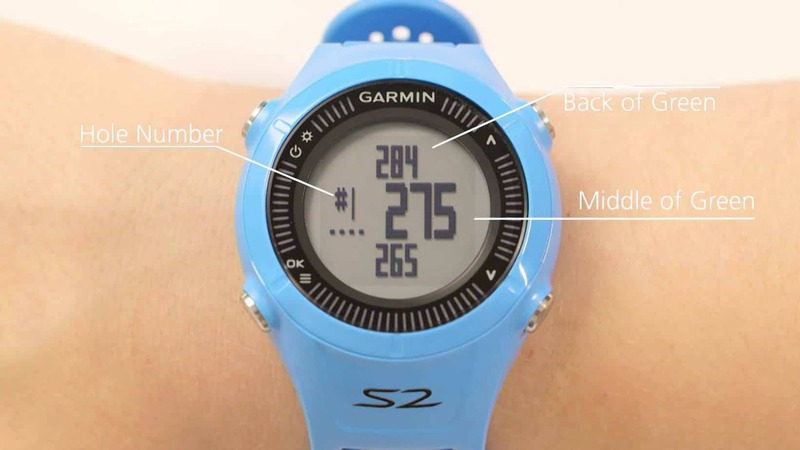 The S20 is not as slim or sleek as the x40, but has a larger watch face and comes with many of the same features. With this golf watch, Garmin is attempting to appeal to consumers who are interested in an Apple watch. 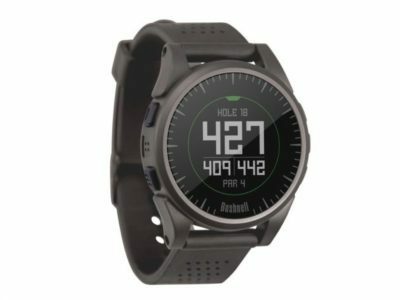 The design of this watch seems to mimic the Apple watch while providing some of the familiar features that Garmin provides in other golf watches. We rate the Garmin S20 as one of the best golf watches for golfers prioritizing battery life and cool practice range features. The Garmin S20 provides the yardage to all portions of the green like other new-age golf watches. Although the S20 doesn’t come with the heart-rate monitoring software of the X40, it still has all of the other cool features. What makes the S20 stand out from other golf watches is its super long battery life. If you’re in the market for a golf GPS watch with great technology that boasts a great battery life, this is the golf watch for you. The Garmin S20 golf watch gives you the yardage to all layup positions on the course, including the bunkers, doglegs, lakes, and other hazards. The watch face on this golf watch is larger than the X40’s and measures the distance to any portion of any hazard on a golf course. With the larger watch face, it’s a little easier to navigate the screen on this golf watch. It is also easier to see the data on the screen of this golf watch. The Garmin S20 features a 0.9” x 0.9” (23 x 23 mm) display screen that is 168 x 68 pixels. This is a much larger screen than x40 golf watch and mirrors the look and feel of an apple watch. The screen is sunlight readable making it easy to see the golf watch during the round. Although this golf watch does not have a touch screen, its simple design gives it an extended battery life and is large enough to display everything you need to better manage your golf round. The Garmin S20 golf watch features a breathable and lightweight watchband that is very lightweight for its size at 1.5 0z. The golf watch is also waterproof (as opposed to water resistant) to 50 meters. The battery life on the Garmin S20 golf watch is its stand out feature. 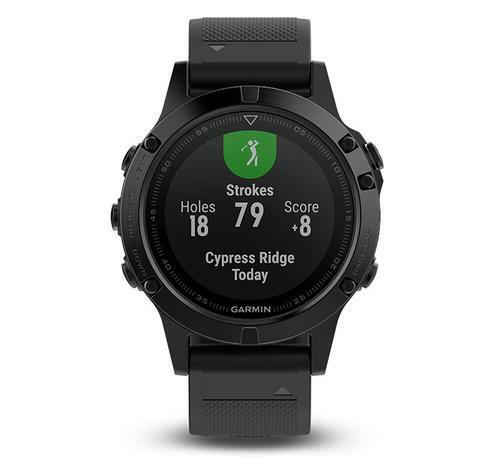 According to Garmin’s website, the Garmin S20 features a lithium-ion battery that will last for 15 hours on full GPS mode before the golf watch needs to be recharged. This is 10 hours longer than the Garmin X40 and much longer than the Garmin S6. Put simply, this is the best golf watch battery in the Garmin line of golf watches. 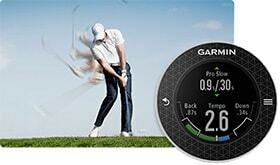 The Garmin S20 golf watch comes with the AutoShot Round Analyzer just like other new products in the Garmin line. This feature automatically detects shots during the round and gives you data on all of your strokes. This is a great feature of this golf watch and is a big reason why Garmin leads the field in golf watch technology. The Garmin S20 golf watch Garmin Connect feature tracks golf rounds and allows you to upload data to the internet. After doing so, you can compare your golf watch data with the Garmin community to see how you stack up. This feels sort of like a video game feature allowing you to see how you compare to other golfers. This Garmin S20 golf watch allows you to keep the score on the golf watch. This feature saves you time and frustration that comes with recording the score on a scorecard and keeping track of it after your round. All Garmin golf watches come with this feature. It’s a great option for detail-oriented post-round analysis. The Garmin S20 golf watch also has an optional feature called TruSwing. TrueSwing is a great practice feature that attaches to your golf club. TrueSwing gives you real-time 3-dimensional animations of your golf swing and other metrics that are great for figuring out how to optimize your game. This feature is great for the golf range and provides helpful stats that shave strokes off of your game. The Garmin S20 golf watch has a fairly sleek and stylish look and feel. Garmin has a habit of mimicking the style of popular watch technology and this golf watch is no different. The S20 golf watch is Garmin’s version of the Apple watch. As such, it’s a pretty stylish watch that can be worn to the office and in casual settings. Although the golf watchband is athletic looking, it has a high end feel that will do well in most settings. This golf watch is the best option for a golfer looking for a product that can last multiple rounds. The Garmin S20 is accurate, has reliable features, and is compatible with Garmin’s best golf watch technology. To take full advantage of this golf watch, you should buy the Garmin TruSwing Technology. 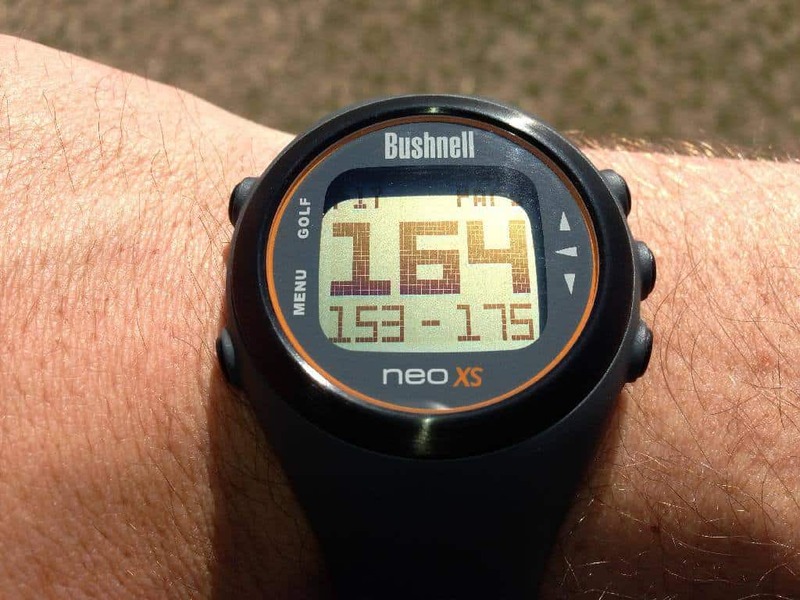 The Bushnell NEO XS Golf GPS watch is a solid and competitively priced entry-level GPS watch that offers functionality and a few features that may surprise you. 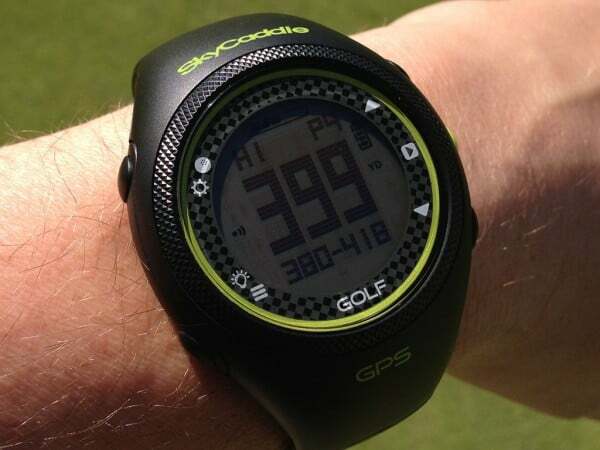 The GPS watch provides accurate yardage and is easy to read. Although it doesn’t come with the bells and whistles of the high-end GPS watches, it certainly gets the job done. While it’s not at the top of our list, Bushnell’s solid product squeaks in on the elite list of the best. This watch’s readability, dependability, and price make it one of the best golf GPS watches. Overall, this watch is a great option for budget-conscious golfers looking for more than the traditional “front, middle, back” yardages to the green. The price point for this GPS watch is great and it includes a few features that you may not find with similarly priced items. 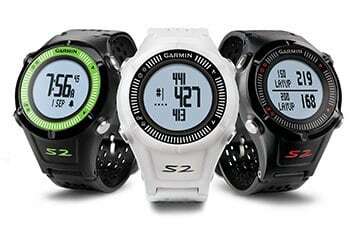 We recommend comparing this watch to the Garmin S2 before making a purchase. But there is no doubt that this is one of the best golf GPS watches for the money. Click the link below if you’re interested in checking out the price on amazon.com. Many golf companies are getting into the golf GPS watch business these days. The GPS watch technology has become fairly stable and accurate. This is allowing many companies to create products in an increasingly competitive market. With our best golf GPS watches of 2019 review, we strive to provide you with accurate and bias-free information about the best products on the market. However, we would also like to provide you with a complete picture of the golf GPS market. To that end, below you’ll find golf GPS watch reviews for the golf watches that we do not consider the best golf GPS watches of 2019, but still warrant analysis. 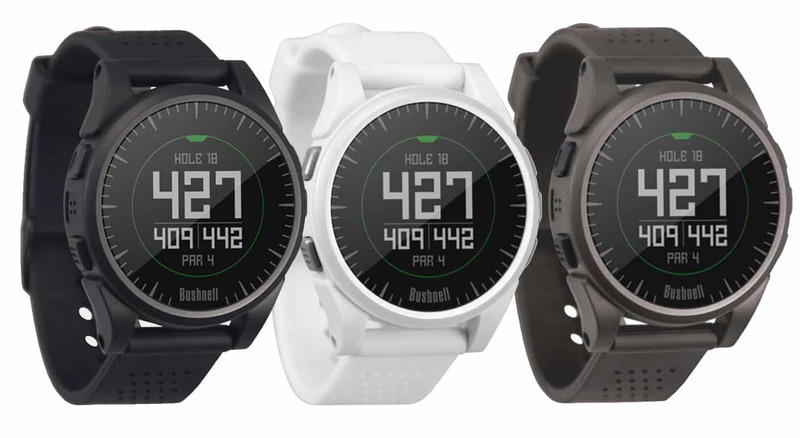 Because all golfers are different, some of these watches may be right for you even though they did not make our short list of the best golf GPS watches of 2019. The SkyCaddie Golf GPS Watch is a meat and potatoes watch that offers its users the very basics. If I had to distill this review into a few words, this golf GPS watch “gets the job done.” It’s an option for someone just getting into golf, but there are better options available for the price. If you want the very basics of a golf GPS watch but do not want to spend a lot of money, we recommend checking out the Garmin S2. Because there are better options out there for a similar price, the SkyCaddie golf GPS watch is not one of the best golf GPS watches. 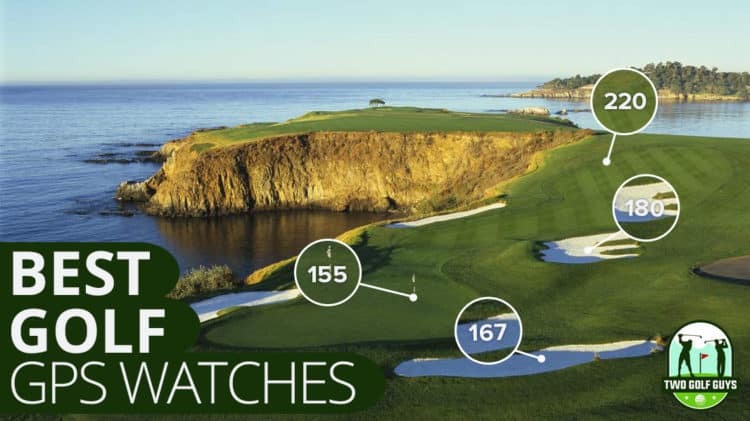 The watch offers just over 30,000 golf courses worldwide. This is about 3,000 courses fewer than comparable golf GPS watches on the market. If you’re primarily playing in the U.S. and well-traveled courses internationally, this probably wont make much of a difference. But it’s something to keep in mind. Although you should never purchase a golf GPS watch for the way it looks, style still matters. A good golf GPS watch should be stylish. It should allow its wearer to go from the office to the course without any real cause for concern. Visually, this watch won’t offend anyone and can generally be worn in any setting. 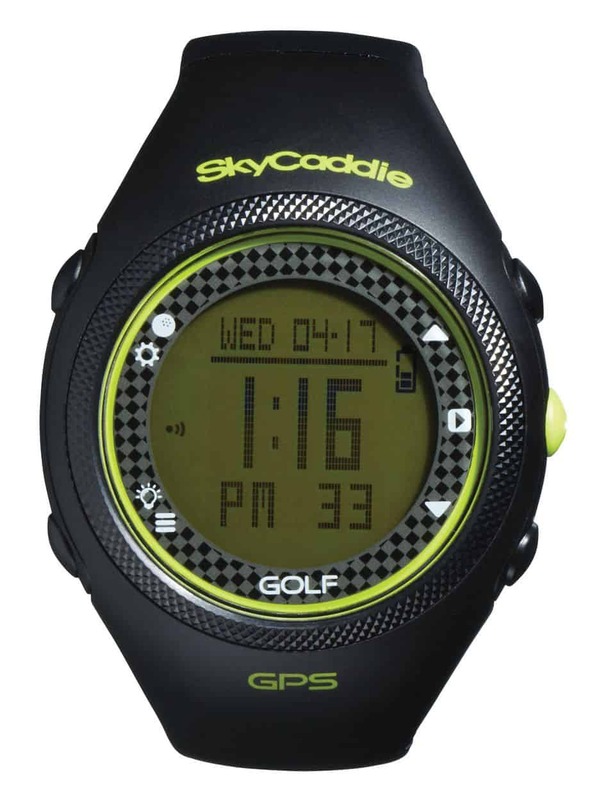 The SkyCaddie Golf GPS Watch avoids looking like a Timex, and can be worn with a business suit. Although you won’t get a compliment while sitting at the bar when you’re wearing it, you won’t feel self conscious either. This golf GPS watch was designed for the budget-conscious golfer, but does not come without its drawbacks. On the up side, it’s running about $20-30 cheaper than comparable watches right now. It’s a solid option for a golfer looking for a basic golf GPS watch who has an absolute maximum budget. Although it is not one of the best golf GPS watches, this golf watch gets the job done. Why Use Golf Watch Technology? As golfers, we’re always looking to improve our games. While we may not play quite like Jason Day or Dustin Johnson, we can definitely manage our games like them. And the simplest, most effective way to manage your game and lower your scores is to have accurate yardages and information provided by the latest in golf watch technology. How will a golf watch help my game? We’re all looking to shoot lower scores because golf is more enjoyable when you’re busy making birdies and pars. In order to see more circles on the scorecard we need accurate information. A golf watch is essentially a caddie for non-professionals. As yourself, when was the last time you watched a pro play without a caddy? Even the best golfers in the world can’t hit perfect golf shots every time they strike a ball. But one thing both professional and amateur golfers alike can do to play better golf is obtain accurate yardages. You may think you can obtain yardages from sprinkler heads on the golf course, but there is a trend to remove them. Even if you’re lucky enough to find one, yardage markers often have only the yardage to the middle of the green. This leaves golfers without the true distance to the pin. The last thing you want to do when hitting a golf shot to the green is guess the yardage. It’s difficult enough to hit a wedge to a scoring distance, but if you’re guessing yardages it becomes almost impossible. Although some courses have GPS yardage systems on their carts, these carts are not prevalent enough to rely on. Additionally, if you like to walk the golf course, they won’t help you during your round. These golf cart GPS systems also tend to be less accurate than the latest golf watch technology. 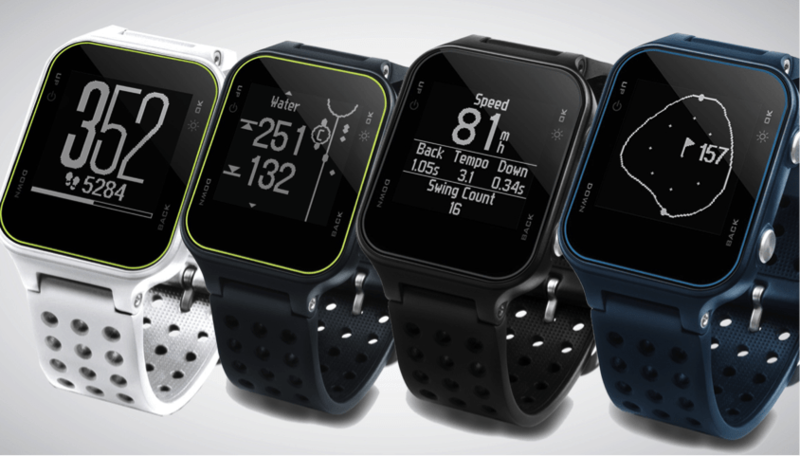 Golf watches like the Garmin S6 feature color touch screens allowing you to move the pin anywhere on the green. The advanced technology in these golf watches allow you to obtain laser sharp yardages. No more guessing involved. They make the most difficult game on the planet a little easier – something every golfer can appreciate. In golf, a subtle change can mean all the difference in the world. It’s safe to say that if the professionals could use golf watches in tournament play, they most certainly would. I just play for fun, so why use a golf watch? It’s true, not every golfer cares about their score at the end of the day. As a matter of fact, a lot of golfers don’t keep score. Golf is about more than shooting a low number. Good times with friends, some solid shots, and maybe a birdie or two should be good enough. This type of thinking will certainly help your psychological health. While a chunked wedge isn’t the end of the world, playing an slow round can still be very annoying. Thankfully, innovations like golf watches are speeding up the game. It’s not necessary to spend time looking for yardage markers when you have a golf watch strapped to your wrist. A device that feeds you accurate yardages from any spot on the course. Golf watches save you time and effort so you can focus on joking with friends and hitting quality shots. Can a golf watch make my swing better? Unfortunately, simply wearing a golf watch won’t make your swing into a carbon copy of Justin Thomas’. And a smashed 340-yard high draw may not be your next tee shot. But the good news is that many golf watches come equipped with features designed to improve your swing. Some golf watches feature tempo trainers. Basically, the golf watch makes audible beeps to signal three key moments in the golf swing. If you ever find yourself “getting quick” or “rushing” your swing, a range session with a golf watch can help out quite a bit. High-end golf watches (namely, the Garmin line of golf watches) can give you a glimpse of your swing power and other helpful technology. However, golf watches are not perfect technology. They won’t tell you your clubhead speed, and strapping your golf watch to your driver head is a bad idea. But there is no question that golf watches can do a lot to help your game. 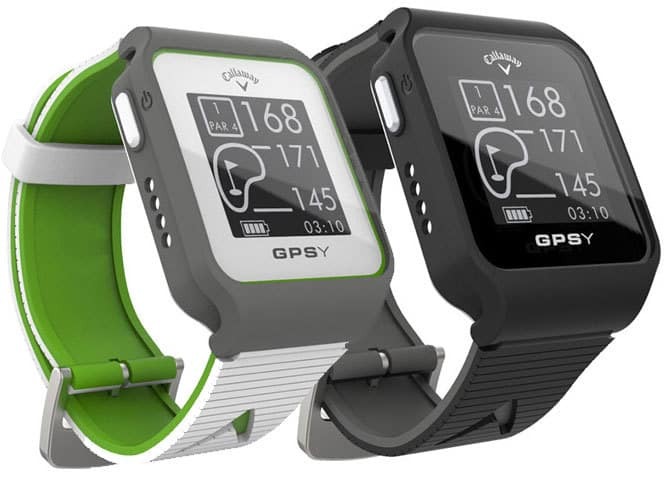 Which golf GPS watch should I use? There area wide variety of golf watches and the best one for you depends on your style and budget. There are a handful of core features that pretty much all golf watches have in common. They tend to come with thousands of pre-loaded courses, they give you yardages to the front, middle, and back of the greens, the watch displays are easy to read, and they’re lightweight so they feel comfortable on your wrist. High-end golf watches separate themselves from other golf watches by offering advanced features. These features include swing aides, other relevant information like the distances to hazards, more preloaded courses, color displays, longer lasting batteries, and touch screens. For example, the Garmin S6 has a touchscreen allowing you to move the pin to obtain even more precise yardages. The technology in these watches is beyond impressive. While the most economical golf watches hover around $99, the most advanced watches can cost over $300. There are a number of manufacturers out there but Garmin owns the majority of the market and makes quality watches across the complete price point spectrum. The best golf watch for you is largely dependent on how much you’re comfortable spending. We consider the Garmin S6 to be one of the best golf watches on the market. It boasts the most advanced features of any golf watch and has a stylish look and feel. If you’re comfortable spending over $300 on a golf watch, the Garmin S6 or similar golf watch should be high on your list. What if I don’t want to spend a lot of money? If you don’t want to spend over $300 on the very top notch golf watches don’t worry. The most important feature a golf watch can offer is accurate yardages. And there are plenty of golf watches on the market that give you the precise distances to hazards and greens. Golf will always be both fun and frustrating, but a golf watch is a worthy investment. You’ll play faster, hit it closer, and shoot lower scores. Simply put, you’ll enjoy your time on the course more. And that’s really what the game is all about. Thanks for the in-depth review! I purchased the Garmin S6. I love it! No problem, Bob! I’m glad we could help! Damn, thanks for providing such in depth reviews! No need to look elsewhere! No problem, Jay! We’re glad you found the reviews helpful. Good luck out there this season! The Garmin S2 works well. However, the battery has a life of 18 months, and is not user replaceable. Garmin charges $80 to replace it….. Thanks for the comment Frank! I’m surprised to hear that your Garmin S2 only lasted 18 months. I owned and used this watch for over three years with zero issues. In fact, when compared with some of the newer watches, its batter life is actually a bit better because of its simple and classic design. Perhaps you could try contacting Garmin? Though i’d imagine the warranty has probably expired. If you figure out a way to replace it yourself, i’ve found a replacement battery on Amazon for only $25. Here is the link: https://www.amazon.com/gp/product/B00O1C9AYU/ref=as_li_qf_sp_asin_il_tl?ie=UTF8&tag=tgg-gw-20. Good luck and swing well! The S6 does calculate shot distance. All you need to do is click a button on the outer rim of the watch when you would like to begin measuring the distance (from the tee or other location) and it will automatically track the yards between the starting point and the end point (wherever your golf ball lands). Hope you enjoy! If cost isn’t an issue get the 5X if you multi sport. If you only want a golf watch then it’s kinda wasting money. Thanks for your in depth reviews. I was going to pull trigger on the Garmin Approach S60 and then saw the new Skycaddie Linx GT and it looks like a better model. Have you reviewed and/or what are your thoughts? In addition, I really want to have a nice looking all around watch with the golf GPS and tracking capability. Have you reviewed any of the Android wearables with compatible apps vs. dedicated golf watches? I am hoping the new Samsung Gear Fit2 Pro would be the one. Have you seen or have any other recomendations for watches and apps? Wow, this is a tremendously detailed review of the best golf GPS watches. An older model I had broke down recently, and so I’m looking for a new watch. It’s no surprise that the Garmin Approach S20 is on this list – people are praising it left and right. I’m very close to deciding on the S20 at this point, although a few other models do interest me. I know this is a little off topic, but what are your thoughts on the Garmin Approach G8 (not a watch)? Thanks! 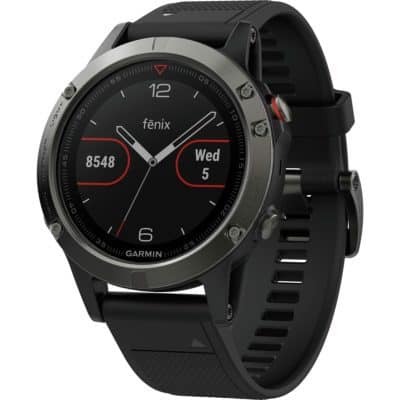 one thing I cant figure out is if the Fenix 5 is required to be connected to your phone or if you can download the course you want and leave your phone at home or in the car. I think the best GPS watch is the S60, excellent analysis and very detailed everything. Thank you, guys! Greetings! Hi Shelby, you can submit via scholarship at twogolfguys.com. We had submissions come in yesterday and today so it’s definitely working.